And so perfect, since E is on submarines. 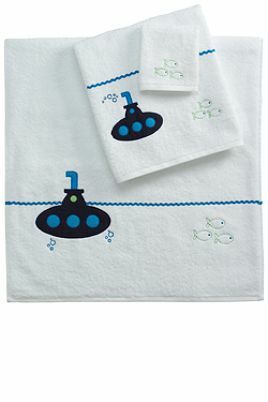 Plus I’ve been thinking about doing an under-the-sea theme for the nursery, and this might have just made my decision for me. Towels are from Land’s End. Adorable! And the first purchase is always fun — whether or not it is necessary or practical. Those are almost as cute as Shawn Johnson, who I am convinced is apple pie in human form. Very cute. And not to sound like an advertisement, but I got this pretty little sonogram frame for one of my expecting girlfriends: http://www.uncommongoods.com/item/item.jsp?source=family&itemId=16019. Not practical at all, but fun and cute. DZ – I’ve got the Uncommon Goods catalogue on my coffee table, with all the cute stuff circled. I’m hoping while my family is in town they pick it up and take note. But that’s so cute I might just buy it myself! So cute! And under the sea sounds like a great theme! Oh @ sarrible, Shawn Johnson is basically apple pie in human form! She’s so cute. That’s perfect. And we must keep Jason Biggs away from her. But I thought we all lived in a yellow submarine? Now they’re saying blue? My mind can’t handle that. I just squealed out loud in the middle of the Apple store waiting for my computer to get diagnosticated. THANKS A LOT. @ lalaland13 – Ha! I thought of the Jason Biggs thing, but couldn’t come up with another way to describe her adorable, perky Americanness. I think she and Jonathan Horton should start their own Justice League.